There are many great books. Today, I’m nominating one that will never make any established list. But it’s the work of a nice Jewish photographer who honors his grandmothers in its dedication. With that, and since this volume presents a positive view of women “of a certain age,” how can I resist? The reader hardly even notices that several of Cohen’s subjects use canes until one of them says, “I thought I’d be an old lady with a cane who keeps on dancing, and it looks like this has come true.” It’s the dancing, not the cane, that really counts. A praise-filled bit from The New York Times graces Advanced Style’s back cover, crediting Cohen for “…focusing on a large — and astoundingly overlooked — demographic: the silver-haired set.” And Ari has now gone even further: Publication of his second volume has just been announced; this time, along with women, he has also turned his lens on men! 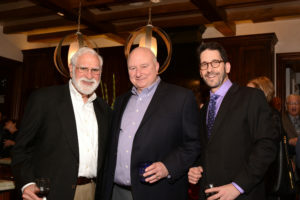 The Dallas Jewish Community Foundation recently hosted a reception in honor of its sponsors chaired by Sherry and Kenny Goldberg and Marilyn and Donald Schaffer. The event was a meaningful way to give back to the dedicated sponsors of the DJCF as their continued support of the Foundation has always been felt and appreciated. The reception was held in the beautiful home of Ilana and Semyon Narosov. The combination of wonderful people, delicious food and amazing artwork made this an unforgettable night. On June 1, DJCF will hold its annual scholarship reception. 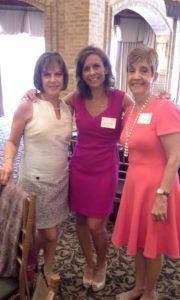 On Tuesday, May 10, 2016, over 200 members and supporters of the Greater Dallas Section of the National Council of Jewish Women (NCJW) gathered for brunch to honor longstanding members of its leadership and to install their 2016-2017 officers and directors. 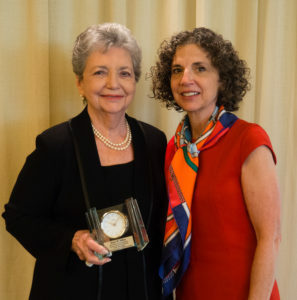 In remarks that reviewed the past two years of the organization’s work within the Greater Dallas area, outgoing President Caren Edelstein thanked all the officers and members who worked with her in an effort to promote the programs and projects of NCJW within the community. Newly installed President Joyce Rosenfield spoke of how delighted and humbled she is to be assuming the position of NCJW president for 2016-2018. She thanked all those who have given of their time and effort in the past and all those who have accepted positions to be part of NCJW’s leadership going forward. Amy Schachter (Emerging Leader Award); Rabbi Nancy Kasten (Janis Levine Music Make-A-Difference Award). 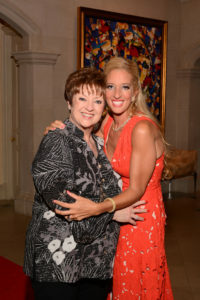 Bette W. Miller (Lifetime Achievement Award); and Cheryl Pollman (Hannah G. Solomon Award). Robin Zweig and Pat Peiser officially installed the incoming officers, directors and the 2016-2017 Nominating Committee. NCJW Dallas Executive Director Suzi Greenman expressed her gratitude to all those present who worked with her in the past year, and to the incoming officers and board. She noted the varied programs and projects of NCJW and encouraged those present to become involved. For information about the activities, programs and projects of NCJW and how one can get involved, contact Nicole Gray at info@ncjwdallas.org or 214-368-4405. Congregation Shearith Israel will host its Golden Years Shabbat at 9:30 a.m. Saturday, June 4, in the Aaron Family Main Sanctuary. 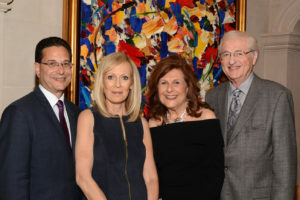 The Kiddush is sponsored by the Shearith Israel SISterhood and Eileen and Michael Stuart-Shor, Susan and Frank Shor, Margie Shor and Jodi and Bill in honor of Sunny Shor’s milestone birthday. The Israel Dallas Center presents David Broza in concert on Monday, May 30 at 7 p.m. at Congregation Shearith Israel. Israeli superstar David Broza is considered one of the world’s most dynamic and vibrant performers. From his whirlwind finger picking to flamenco percussion and rhythms to a signature rock-and-roll sound, Broza’s charismatic and energetic performances have delighted audiences throughout the world. Since 1977, when his hit song Yihye Tov first hit the airwaves, Broza has been working to promote a message of peace. The song’s lyrics, roughly translated as “things will be better,” struck at the heart of the issue — that people all over the world want peace. Now with a string of multiplatinum albums behind him, David Broza still strives to hone this message. Broza was awarded a Spanish Medal of Honor by the king of Spain, Juan Carlos I, for his longtime contribution to Israel-Spain relations and his promotion of tolerance. He has also been named a Goodwill Ambassador for UNICEF. A powerful musician, peace advocate and music industry innovator, Broza awes and inspires audiences with his sincere message and musical allure. 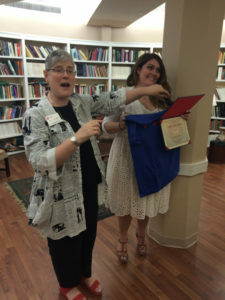 Photo: Ben Tinsley Dr. Shira Lander (left) presents graduating Southern Methodist University senior Robyn Ann Langley (right) with a T-shirt during a Friday, May 13 reception in the Thompson Reading Room of SMU’s Dallas Hall. Langley was honored for being the first student to complete the newly developed Jewish studies minor. DALLAS — This year, senior Robyn Ann Langley of Boca Raton, Florida, became the first Southern Methodist University student ever to minor in SMU’s newly-established Jewish Studies Program. On Friday, May 13, the 22-year-old was lauded for that accomplishment in the Thompson Reading Room of SMU’s Dallas Hall. Several professors, school officials and SMU alums were there to applaud her. The timing for this reception was excellent. Langley had a huge, life-changing event happening the very next day. The Jewish studies minor was formally established just this year. But Langley — who is Jewish — was “grandfathered” into the program because she’d already taken nearly all of the 12 hours of required courses on her own. She acquired the hours pursuing a religious studies minor. Langley, described by colleagues as a talented artist and designer, earned her degree in fashion media at the Meadows School of the Arts. But she made a point of taking Jewish studies courses throughout her time at SMU. There currently is not a Jewish Studies major and it is unclear when or if one will be established. But school officials say the minor is picking up steam. As many as 500 students currently take Jewish studies courses. But Dr. Lander said there are three students — juniors — who are actively declaring the minor. They will attend Jewish studies classes next year. From her standpoint as a graduating senior, Langley said she sees this new minor as a way to attract more Jewish students to SMU. Dr. Lander said Langley’s count of Jewish students currently at SMU is correct. As of 2015 the student population at SMU numbered 11,643. Langley said the Jewish population was scarce when she first attended SMU. She said she met many female students who told her they’d never met a Jewish person before. “It was a culture shock,” she said. Rabbi Heidi Coretz, meanwhile, has been director of Hillel of Dallas — which serves the campus of SMU — for the past 12 years. The rabbi said she has seen SMU evolve from a regional campus into a national university. One of the professors teaching Jewish studies classes is Dr. Serge Frolov, who is professor of Religious Studies and the Nate and Ann Levine Endowed Chair in Jewish Studies at SMU. Dr. Frolov said there are high hopes for the Jewish studies minor. This creation of the Jewish studies minor was thrilling news to David Zimmerman, a Jewish SMU alum who graduated from the university in 2002 with a major in broadcast journalism and a minor in religious studies. “This is huge!” Zimmerman said at the Langley reception. Zimmerman — also a member of the Hillel Dallas Advisory Board — is athletic director, boys’ varsity basketball coach and director of co-curricular activities at Yavneh Academy. He said having a formal Jewish studies minor will make a huge difference because it will allow Jewish students to be mentored by Jewish professors. Zimmerman said it is important that new SMU students find other Jewish students with whom to interact and maintain their Jewish identity while in college. Langley, meanwhile, said her next step in life is to study for, take and pass the Law School Admission Test so she can study law at colleges such as the University of Miami. She hopes to eventually be an attorney in the area of celebrity entertainment or fashion law. Born in Miami, Florida, Langley moved to Boca Raton at age 4. There, she enrolled in the Jewish Community Center preschool and continued her involvement in the Jewish community ever since. She attended Hebrew school at Congregation B’nai Israel and was confirmed in 10th grade. Langley said she continued working at B’nai Israel as a madricha (teacher’s assistant) and was part of the synagogue’s Senior Youth Group (BISY, a National Federation of Temple Youth affiliate). She has been involved with many Jewish organizations — such as Ruth Rales Jewish Family Services, JAFCO-Jewish Adoption and Family Care Options, and the Otzar Program for Special Needs. Langley said she most enjoyed working as the lead art and design volunteer for the Otzar Special Needs Sunday school. 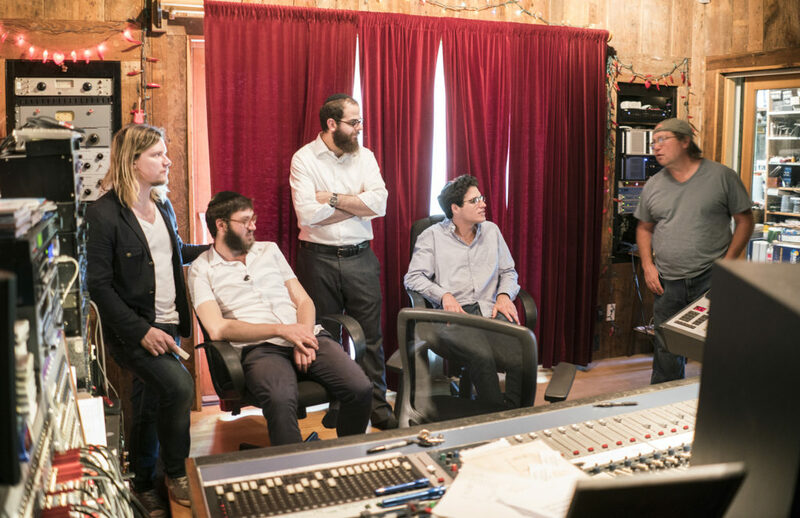 DALLAS — A former Intown Chabad of Dallas rabbi, a Brooklyn rabbi and a veteran Dallas musician are collaborating with an assortment of Deep Ellum jazz musicians on an album of Hasidic Jewish melodies. While it is true that bringing together jazz musicians on a project of this nature is not a typical move in Hasidic communities, the results are undeniable, explained Chanan Rose, the former Chabad of Dallas rabbi who is producer on the project. Recording these Jewish melodies with musicians from such different backgrounds results in a very rich and warm sound true to its heritage, Rose said. The first single, Niggun Rostov (circa 1918), has been greatly praised by Jewish communities and it is about to be released for broader public consumption. The release of this single roughly a month ago was the harbinger of a much larger project — the recording of a nine-song album, using melodies spanning nine generations of Hasidic leaders: Niggunim. The group hopes to have that entire album mixed and mastered by mid-August. They have launched a crowdfunding campaign on their website, www.niggunsociety.com, to raise support and funds. Rabbi Shlomie Rabin of Brooklyn — an accomplished Hasidic singer — said he is very happy with both the result of the first single and the promise of the remaining album. Rose and Rabin, who live in the Chabad Hasidic community of Crown Heights, Brooklyn, said they started developing the idea roughly eight months ago. The two eventually reached out to Dallas musician Stephen Ketner, cofounder of Kulmus Records, to help them navigate the world of music. The result? The creation of the Niggun Society, which was able to cultivate a sound steeped in tradition that reflected an innovative approach, said Rabin, lead vocalist for the project. A niggun is a form of Jewish religious song — vocal music containing repetitive sounds such as “ai-ai-ai!” or “bim-bim-bam” rather than specific lyrics. Some of these largely improvisational songs are prayers reflecting lamentation, while others may be about joy or victory. Throughout the ages, Jewish people have used these wordless and meditative melodies to connect to the unity of God’s existence. Ultimately, they are crucial to Hasidic Jewish worship and reflect what has been described as the mystical joy of intense praying. This journey resulted in a return to North Texas for Rose. He, Rabin and Ketner ventured to the legendary Palmyra Studio in Palmer — a world-class big studio steeped in amazing acoustics, fantastic equipment and more than its fair share of rock-‘n’-roll mystique. Ketner said this studio has a mixing console from the Beatles work on Abbey Road and a reel-to-reel that Elvis Presley recorded on (or so legend has it). The Palmyra Studio also is known for its production of the music of Erykah Badu and Buddy Miles. Needless to say, all parties involved felt the vintage recording studio was a perfect fit for this unique project. With Ketner producing and arranging, the group recorded Niggun Rostov in early April. The feedback from the Jewish community was very positive. During a Wednesday, May 11 telephone interview from Brooklyn, Chanan Rose and Shlomie Rabin said they first met in Israel about five years ago and reconnected in New York City two years ago. Fast friends on both occasions, the duo quickly discovered they shared a love of all things musical. Chanan Rose said he met Stephen Ketner at the blues and jazz music scene of Deep Ellum (Rose said he felt drawn there) while working as a rabbi for Uptown Chabad in Dallas. They became friends and musical colleagues. Rose even took guitar lessons from Ketner. Needless to say, Ketner was a natural fit for this project, Rose said. “When this idea came up, I immediately thought of Steve,” he said. Ketner, an established Dallas-area musician, explained that he had literally (as in, within the same hour) just returned from Los Angeles as part of one leg of a tour with the Freeloaders, a Cajun jazz band. He primarily played guitar on this tour. As the person who composed the arrangement for the single, Ketner described the experience as eye-opening on many different levels. Rose and Rabin’s idea for the single was to coincide its release to commemorate the Lubavitcher Rebbe of Chabad’s birthday, 11 Nisan, which this year corresponded to April 19. The revered Rabbi Menachem Mendel Schneerson passed away June 12, 1994. But they wanted a place where the recording quality was superlative, not substandard. That would be Palmyra Studio. Stephen Ketner said they recruited and hired several Dallas jazz and rock musicians to record the classic Jewish music there. Engineer Sam Damask mixed the single. Greg Calbi, of Sterling Sounds, NYC, mastered it. As the work on the single progressed, Stephen Ketner said he could tell there was a serendipitous vibe in the air. It was something very positive, very amazing — and incredibly forgiving. Ketner said he learned from his new colleagues that in the Chabad movement, the music is the upward connection from the spirit to God. Ketner said the entire experience has been a revelation. The single is available to be heard online for free at: www.niggunsociety.com/thesingle/. DALLAS — Dennis Ross, American diplomat, author and former U.S. Ambassador, had a bit of a brain teaser for his audience Tuesday, May 3. “If I were to ask you, ‘What do you think President Obama’s most important objective in the Middle East is during his remaining time in office?’ what do you think it would be?” he asked. Ross is a bit of an expert on Middle East mindsets in United States administration — having worked in various positions during the administrations of U.S. Presidents Ronald Reagan, George H.W. Bush, Bill Clinton and Barack Obama. Additionally, he has penned several books on American foreign policy in the Middle East. End the civil war in Syria. Build his relationship with Iran before leaving office. Promote the resolution of the Israeli-Palestinian conflict. Deal with ISIS in some definitive fashion. 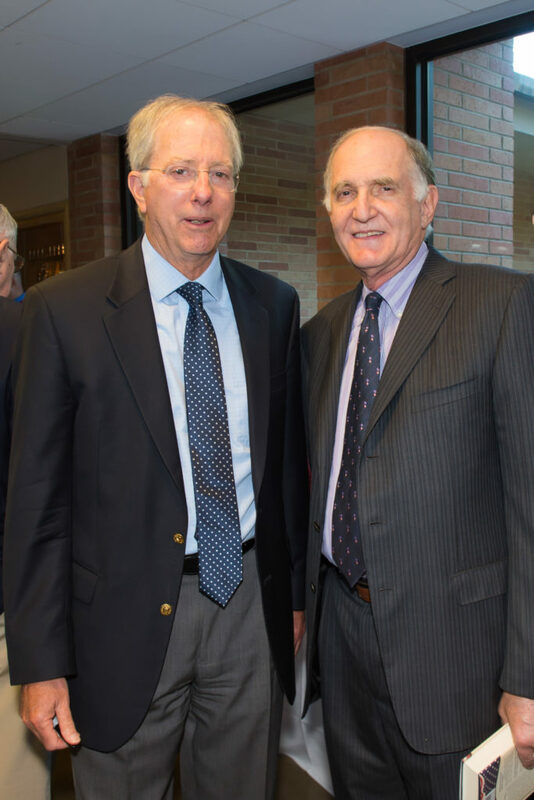 At this point, Ross was at least 25 minutes into his presentation but had not yet referenced his recent book, Doomed to Succeed, which focuses on the history of Israel-U.S. relations from Truman to Obama. Ross said he posed the “president’s main focus” question first because it is reflective of a common mindset in which Israel is regarded as a troublemaker. Small groups with that mindset have been in every administration, he said. “It has shaped their assumptions about the region,” Ross said. The only administration where anti-Israel sentiment held no sway was that of Bill Clinton, he said. This bias was displayed by the Obama administration as recently as Oct. 1, 2015, when there was a wave of random shootings and stabbings in Israel, Ross said. It took the Obama administration more than seven days to condemn the terrorists instead of referring to the incidents as a cycle of violence, he said. That aforementioned mindset was the reason, Ross said. This mindset dictates that any blame be spread equally among the Palestinians and Israelis for fear of a backlash, Ross said. Indeed, it is easier to use the three words “cycle of violence” because it places blame on both sides equally. This is regardless of where the blame should actually belong, he said. President Obama told a group of people in 2009 that the relationship between the U.S. and Israel needs distance — that a “lack of daylight” was not a good thing. Bill Clinton, on the other hand, constantly downplayed any differences with Israel. The evening at Congregation Shearith Israel began with a private Marshall Society Reception followed by the public program and book signing. The event chairs were Larry Ginsburg, Sherry and Kenny Goldberg, Ann and Nate Levine, and Middy and Mark Unterberg. Ross, Counselor and William Davidson Distinguished Fellow at The Washington Institute for Near East Policy, told the audience he finds himself asked quite a bit how he could function as a political appointee for two Republican presidents and two Democratic presidents. When asked “How did you do it?” Ross agreed it was a bit of a balancing act. Submitted photo The 12-by-8-foot mosaic mural will resemble Torah scrolls once finished. DALLAS — Students, teachers and family members have been working ferociously at Akiba Academy since last week to create a memorial mosaic mural in time for eighth-grade graduation June 5. This mosaic will commemorate the late Larry Lampert — father of Akiba eighth-grader Jessica Lampert — who died of a heart attack in 2011. 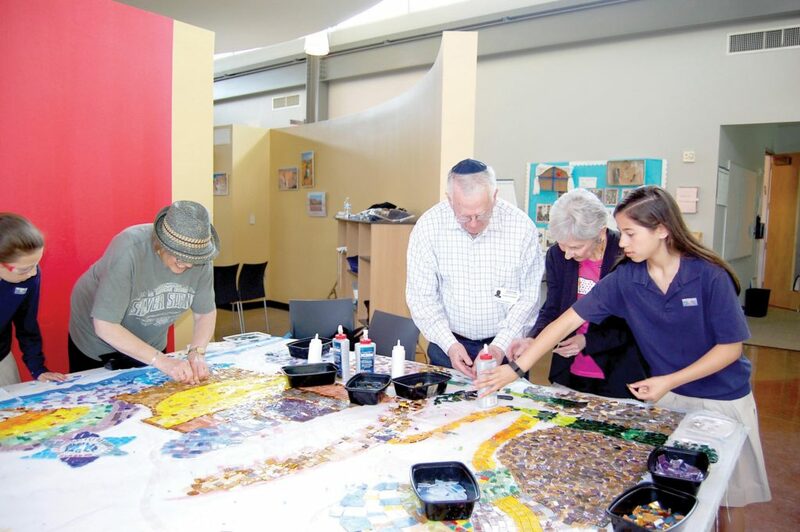 Once finished, the 12-by-8-foot mosaic mural will be framed to resemble Torah scrolls. Its images will illustrate the hopes, dreams and promise of Israel, explained Rena Fruchter, the project’s artist in residence. When completed, it will be installed in an Akiba prayer sanctuary. The project was brought to Akiba by Jessica Lampert’s grandparents and their daughter Naomi Pollard. Akiba students ranging from preschool to eighth grade have joined Jessica Lampert and her family, staff members and other parents to help work on it. Tanya Lampert — Larry Lampert’s mother and Jessica Lampert’s grandmother — said it is fitting this project is being completed at Akiba, a school very important to the Lampert family. Tanya Lampert said her son “got a real kick” out of his children attending Akiba. Rena Fruchter, a former art teacher and arts integration director at Berman Hebrew Academy in Rockwall, Maryland, was contacted by Tammie Rapps, Akiba head of school, in February about directing the project. Rapps said the project is important for more than one reason. Tanya Lampert and her husband Albert Lampert, both from Silver Spring, Maryland, formally hired Rena Fruchter for the job, and arrived in Dallas to start work on Friday, May 20. At that point, Fruchter said at least 35 hours of work had already been put into the mural — with volunteers abounding. Fruchter said she expects the project to be completed later this week. Jessica Lampert did not immediately wish to discuss the project with a Texas Jewish Post reporter. But Fruchter said young Jessica has been hard at work on the mural. Tanya Lampert said she and her husband were impressed by the progress on the mosaic when they first arrived in Dallas from Maryland. “This was our first look at it and we were overwhelmed with the scope and the fact that the whole Akiba community of children and parents had all been involved,” Lampert said. Rapps said there was a special night last week during which only members of the Lampert family came to work with the artist. Melissa Lampert, meanwhile, said it is very important to remember that the mosaic is in honor of her late husband and her three children. Melissa Lampert said elements of that mosaic remind her of the trip she and her late husband took to Israel a few years ago. The 80th annual meeting of The Jewish Federation of Fort Worth & Tarrant County and Jewish Family Services will take place at 7:30 p.m. Wednesday, June 1 at Congregation Ahavath Sholom. For eight decades the Fort Worth and Tarrant County Jewish community has worked together to care for Jews in need and to inspire Jewish life and its important work continues. President Lon Werner will share the state of the Federation. The new slate of officers will be elected: Lon Werner (president), Diane Kleinman (vice president, Campaign & Allocations), Todd Blumenfeld (vice president, Administration), Robert Simon (vice president, Community Relations), Alyson Halpern (secretary) and Cheryl Visosky (treasurer). New board members and JFS members will be elected as well. The Federation will say thank you to its board members who have completed their terms and we will honor our amazingly dedicated volunteers including Stephanie Zavala and Nancy Schwartz, the recipients of the Barnett-Brachman Young Leadership Award and Milena Razack, the recipient of the Sylvia and Jerry Wolens Award. Special guest speaker will be Max Kleinman (read about his important work at tjpnews.com), a senior consultant with Jewish Federations of North America who is leading an effort to raise funds for Holocaust survivors. The community is invited to join and celebrate our success and honor its volunteer leaders. Charles Henderson Norman has just published his first novel. The Fire in the Rock is the story of the Exodus from Egypt, as told by Tzipporah, the widow of Moses and the last eyewitness. She tells of her childhood and youth in the land of Midyan, living at the foot of the Mountain of God; and she tells us of Moses, her husband and the father of her children. We learn that Moses was a profoundly humble, and troubled, man; he had at last found peace in the desert with Tzipporah and their sons — but after an illuminating experience on the Mountain before the Fire of God, he found himself compelled, almost against his will, to seize the opportunity to free his people and become the Lawgiver amid a series of cataclysmic, but thoroughly natural, events. We learn, too, of Tzipporah’s own astonishing part in these world-changing events. The Fire in the Rock is now on sale online at https://www.createspace.com/4348539 — the price at the CreateSpace eStore is $25 plus tax and shipping. The book is also available — in a signed edition — at the Ahavath Sholom Gift Shop for the same price, and no shipping. The Fort Worth Museum of Science and History kicked off its 75th anniversary celebration Saturday, May 21 with the opening of a special exhibition, “Hidden Treasures: Celebrating 75 Years,” a tribute to some of the Museum’s iconic artifacts from its extensive permanent collections. What began as the Fort Worth Children’s Museum in two classrooms at De Zavala Elementary School now spans 166,000 square feet of extraordinary learning space in the heart of the Cultural District. 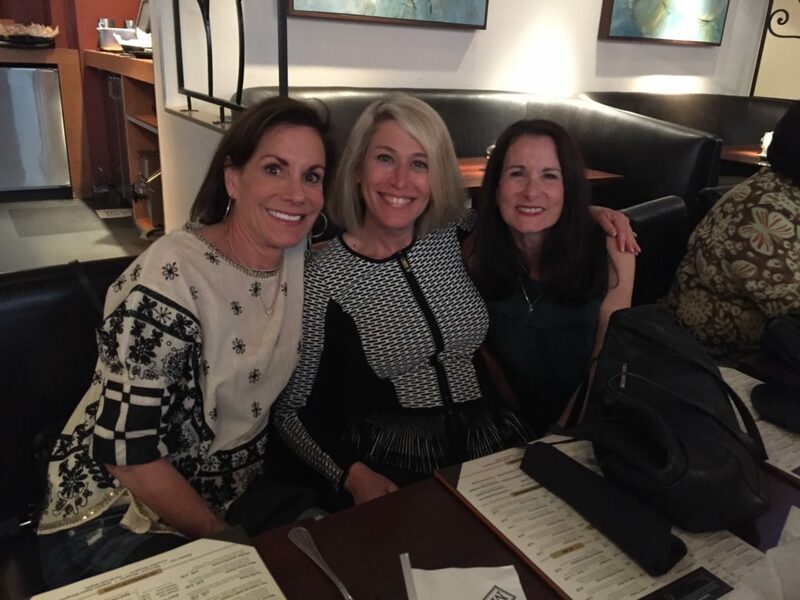 I was sorry I couldn’t be there when Marcie Levine gathered a group of friends at Mi Cocina in Sundance Square on Mother’s Day. Marcie, who is a sales director at Infutor/Inferenda Data Solutions, was in town for a two-day conference. Among those stopping by were Marla and Foster Owen, Denise Kleinman, Arlene and Michael Glaser, Cheryl and Randy Colen, Sandra Gamez, Susan Wisch, Kim Kilpatrick, Kurt Shuster, and Shayne and Lisa Moses. Marcie, the daughter of the late Bea and Irv Levine, resides in Northbrook, Illinois. She is the mother of Ilana, a junior at University of Illinois, and Philip, a rising senior at Glenbrook North High School. We are currently between two major festivals in the Jewish calendar — the Exodus and the giving of the Torah. During this time, we relive the experience of our ancestors by counting 49 days to the big event. When reciting the daily Shema and thinking about the word echad, the soul is said to undergo a mini-Exodus, experiencing the above journey. The most fundamental verse and declaration of God’s unity is the Shema: “Hear O Israel, the Lord is our God, the Lord is One.” (Deuteronomy 6:4) The Hebrew word for “one” used here is echad, which connotes a compound unity, bringing together of parts to form a whole. There is another Hebrew word, yachid, which also implies oneness, but an absolute unity, something inherently indivisible. Now you would think that the command to comprehend an infinite power would use the higher term rather than echad. But there is a greater accomplishment after Creation, when a person is able to look at the world and detect within the diversity and seemingly separate parts how everything is, in fact, being propelled by one force. Indeed this is the deeper meaning of the statement “one nation on earth” — the capacity of our soul to recognize and reveal the oneness in the multiplicity of earthly things. The main mitzvah — in action, not contemplation — to achieve this awareness of unity is tefillin. The Torah mentions it most explicitly by saying: “You shall tie them as a sign on your hand, and they should be for a reminder between your eyes.” Tefillin consist of two perfectly square black boxes containing specific Torah passages (including the Shema and leaving Egypt), inscribed on parchment, inserted inside each box, and attached with long leather straps. These boxes (head and arm) are always worn together, but they are actually two distinct commandments. Following the order of the verse, the hand tefillah (singular for tefillin) is always put on first, even though the head is more holy. Scriptural wording offers another clue about their differences. The box must be “tied” on the arm (active) while the other box should simply “be” situated on the head (passive). This language has several practical implications and lessons. There are certain mitzvahs, such as shaking the lulav, that involve a one-time action and they’re over. Other mitzvahs continue after the initial action, providing an opportunity for fulfillment, like sitting in the sukkah. A similar distinction can be found between the head tefillah and that of the hand. In theory, once you tie the box to the arm, the mitzvah is complete and one can take it off. In contrast, the head tefillin fulfills a mitzvah every second that it rests there. Indeed, there was a time period where it was common practice to wear tefillin throughout the entire day, whether in a synagogue, at home, or in the street. One deeper lesson in the box resting on the head and placing the box against the heart has to do with the intellect and emotions. The above theme of unity in Judaism involves not only faith in one God and one Torah, but also unity within the individual person. There are varying approaches with regard to the best pathway for human conduct: a) Our conduct must be dictated by the cold logic of the mind; b) we should follow our hearts, our lively feelings; and c) what we think and what we feel is not so important; the main thing is the deed — that we act properly. The Torah’s approach is that a person must be complete and strive for perfection in all three areas. Unfortunately, there often exists a schism between the mind and the heart. For example, someone may be very strong intellectually but lack emotional maturity, like a cold professor that knows a ton but feels little. Someone else may be deficient in the opposite sense, governed by their instincts and emotions. When the emotions control the mind the intellect is bribed, utilized merely to provide justification instead of striving to be objective. The first message and meditation of the mitzvah of tefillin is that the head, heart and action must be attuned to each other in order to live a Jewish life. The second message is that the head — remembering the commandments — should penetrate and steer our emotions. We shouldn’t be like a stack of books; we should experience what we learn about. Finally, the tying around the hand symbolizes that knowledge and feelings should culminate in positive action. While character education takes hard, repeated work to effect change, the mitzvah of tefillin facilitates the attainment of unity of mind and heart, intellect and emotion that lead to action. The Internet is wonderful for wondering Jews — so much information! I try to read as much as possible and, as I say to my adult students, find what works for you. To integrate Jewish practice into our lives, it must make sense on many levels. Just this week I read a blog by Laura Duhan Kaplan. She titled the piece Pray Before You Post and wrote about comments from people about her pieces. Words can hurt; we have the Chofetz Chaim to teach us the many rules of lashon hara — evil speech. We say that gossip is a part of life but does that mean it is OK to talk about others and share secrets? We could spend months, even years, studying the Chofetz Chaim and yet does it help us control our words? Judaism is about action and words, but not about thoughts. Unfortunately often our thoughts come out of our mouths before we are done and now our fingers text, email and more without pondering a bit more. Laura Seymour is director of Camping Services at the Aaron Family Jewish Community Center.. Submitted photo Rep. John Ratcliffe (left front, facing camera), R-Texas, was part of a United States congressional delegation that traveled to Israel in early May and discussed homeland security and cyber security with Israel leaders such as Israeli Prime Minister Benjamin Netanyahu and Israeli Minister of Defense Moshe Ya’alon. There is a growing concern in both Israel and the United States that funds from sanctions relief in the Iran nuclear deal could be used to bolster Iran’s ability to launch increasingly sophisticated cyber attacks. The cyber threat posed by Iran has only grown over the past five years, explained Rep. John Ratcliffe, R-Texas. He said a recent cyber security hearing identified Iran as a cyber haven of particularly malicious intent. “Iran’s actions as a cyber aggressor prove the need to take swift action before its cyber capabilities become even more sophisticated,” Ratcliffe said. This topic dominated a Homeland Security and cyber security meeting held in Israel the first week of May. In attendance were a congressional delegation from the United States and top Israel leaders such as Israeli Prime Minister Benjamin Netanyahu and Israeli Minister of Defense Moshe Ya’alon. The meeting confirmed the importance of maintaining America’s unwavering support for Israel as the USA’s strongest ally in the Middle East, stated Ratcliffe, who led that delegation to Israel. “It’s s critical that we remain unified in our collective fight against terrorism,” Ratcliffe said. On Thursday, May 12, Ratcliffe introduced a new bill, the Iran Cyber Sanctions Act of 2016. It would require the president’s administration to impose sanctions on cyber hackers linked to the government in Iran. Various leaders in the North Texas Jewish community cautiously applauded the initiative to protect Israel and America. “I can tell you cyber hackers are something we are very concerned about — especially coming out of Iran,” said Dan Prescott, chairman of the Jewish Federation of Greater Dallas board. Bob Goldberg, executive director at Jewish Federation of Fort Worth and Tarrant County, said he was not familiar with the bill but is always a proponent of cyber security. “Cyber security is certainly is an issue of concern — something of which we are aware and trying to stay prepared,” he said. Ratcliffe’s is not the first bill to go after Iranian cyber terrorists. Just last month, Sen. Mike Rounds, R-South Dakota, introduced a nearly verbatim Senate version of the Iran Cyber Sanctions Act of 2016, known as S. 2756. Ratcliffe voted numerous times against the Iran nuclear agreement when it was brought before Congress in 2015. This was, in part, due to the possibility that increased revenue from the agreement might be used to enhance Iran’s cyber capabilities. Ratcliffe said during their discussions, Prime Minister Benjamin Netanyahu expressed deep concerns that Iran may use funds from the nuclear agreement to bolster its cyber capabilities. “This reinforced the necessity of using sanctions as a tool in deterring such destructive behavior that so greatly threatens our national security,” he said. Last year, the Iran deal created uneasiness throughout the United States. Leaders from the Jewish Federation of Greater Dallas and the Jewish Community Relations Council issued a public statement opposing it. The JCRC sponsored and presented a three-part series about the Iran agreement to educate the community about the many facets of the Iran deal as well as its impact. The American Jewish Committee Dallas invited two speakers to discuss how the Iran nuclear deal was expected to impact the Jewish community. During the recent meeting in Israel, Ratcliffe was joined by Rep. Jim Langevin, D-Rhode Island, who sits with him on the House Homeland Security Committee. 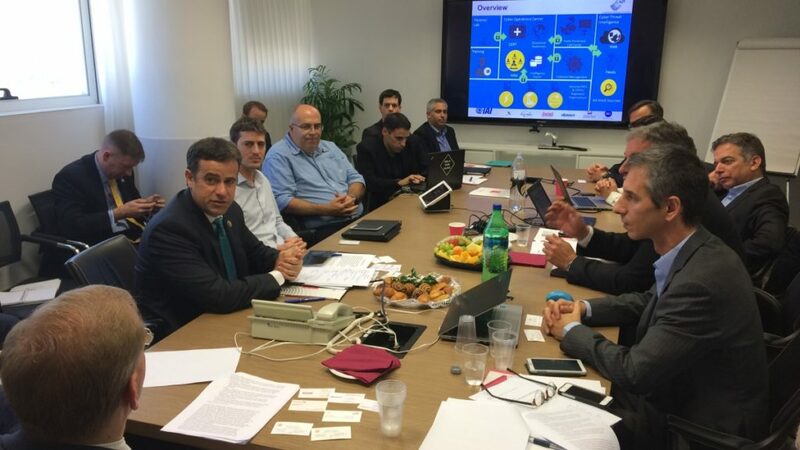 Also in attendance were Iddo Moed, head of Cyber at the Ministry of Foreign Affairs; Dr. Eviatar Matania, head of Israel’s National Cyber Bureau; Isaac Ben-Israel, head of the Israel Space Agency and security and diplomacy educator at Tel Aviv University; Citi’s Technology Innovation Lab; and Microsoft Israel. As the chairman of the House Homeland Security Committee Subcommittee on Cybersecurity, Ratcliffe led numerous cyber-specific meetings with industry leaders and Israeli government representatives. If approved, his new bill pushes the administration to take action on an April 2015 executive order that authorized the Treasury Department to sanction individuals and entities that engage in malicious cyber activities against the United States. In March the Department of Justice announced the indictment of seven hackers connected to the Iranian government. Directed at American banks and a New York dam, the attacks represented the first time the U.S. charged state-sponsored individuals for seeking to disrupt the networks of key industries. “The attacks by the Iran-linked hackers confirmed concerns previously voiced by top experts regarding the country’s malicious intent,” Ratcliffe said. Anita Zusman Eddy, JCRC executive director, said she has not heard any reaction to the cyber terrorism bill or the issue in general from the local community. “But we certainly support strong enforcement against malicious cyber activities against the United States generated by Iran or any other entity,” she said.